The installation of hardwood floors can be very demanding. Most often it is best left to an experienced professional, preferably someone certified by the National Wood Flooring Association which has established training programs. You should only attempt a DIY installation if you are very skilled and have the proper tools. Otherwise, leave it to a pro. There are four basic criteria for a successful installation – a sub-floor that’s clean, flat, dry and structurally sound. Try to bring the flooring into your space approximately a week in advance to let the wood acclimate to its environment. 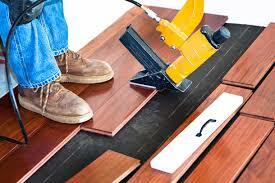 Hardwood flooring can be installed using several methods: nailed, glued or floating. Moisture is wood flooring’s public enemy number one so if you’re planning on doing it yourself, use a wood moisture meter to check for moisture in a concrete or the sub-floor. These can be unexpected sources of moisture that can ruin your expensive new wood floor. A moisture barrier might also be recommended in the case of a concrete slab or below grade installation. Boards are often delivered in random lengths. Before securing the boards to the sub-floor, test fit the boards in sections. Test fitting the boards allows you to make sure that all of the points are staggered. As a rule of thumb, joints should be at least 12 inches apart. Because wood expands and contracts, it’s a good idea to install a humidifier, mostly for the winter months when the temperature and humidity drops and the furnace is running. Air conditioning will take care of most normal moisture issues during the warmer summer months. Cupping or bowing where the wood planks literally shrink or swell which could result in gaps between planks is often the result of wild swings where your floor is exposed to too much and then too little moisture. Not good. This is especially true for solid wood –engineered floors, due to their construction and added dimensional stability, are generally not prone to such issues. After you’ve installed your Beautiful Floor, make sure to send me a photo (sandy@mybeautifulfloor.com) and bask in the adulation of your peers and in the glory of a job well done when we post it to our Heroes gallery in our Pinboard. For those less than fortunate DIY installations, we offer redemption, of a sort. Our Zeroes gallery can at the least help you prevent others from making the same mistakes. We also offer witness protection – no one need know who you really are. Just think of all the floors you can save!